Such a perfect card with which to start a spectacular month! After yesterday’s 10 of Swords signaling the end of August, today the 3 of Cups is all about celebrating the arrival of a new month, which will bring with it a much-needed, positive energy shift. It is possible many of you have taken the day off from work in order to have an extended holiday. Monday, the 4th in the USA is Labor Day, and considered the unofficial end to the Summer season. 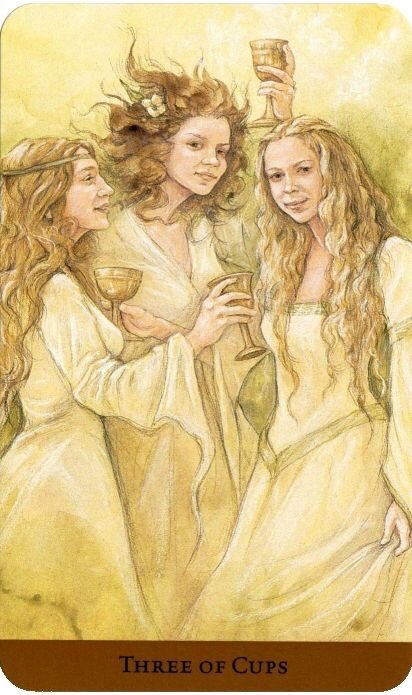 No matter where you are on this planet, the 3 of Cups is here to bring you some positive momentum and to remind you that every day holds a reason to celebrate. Enjoy! This entry was posted in Card of the Day, General Tarot, Love and Finance, Patreon, Readings and tagged 3 of Cups, Card of the Day, Guidance, Path, Reading, Tarot. It is time. Stand up and demand that life be fair; this balance you seek does not come through any type of emotional outlet, rather through a take-no-prisoners approach. It is possible that you need to consider two sides to the situation in order to have the proper clarity, but you do not appear to be taking no for an answer this month. Prioritize your needs from a financial/security standpoint and be certain to follow the rules to the letter of the law. September is the month to overcome the stress, and as October begins, you will see that light breaking on the horizon. Striving to maintain and preserve important relationships will become a priority; these need not be love relationships, it is possible it will be family matters and work security which come to the forefront. Most of September, while there is a great deal of improvement and movement, may feel as though you are still navigating your way through some lingering chaos. But, the good news is that you can and you will. Some bonds should not be broken, even when situations within a relationship create a great deal of aggravation. Remain grounded and do not let your emotions rule your decisions. Your hopes and dreams can appear challenging, even quite daunting at times, but as overwhelming as it can all be, maintaining a balance within various aspects of your life, i.e., work and home, can see you through the fog, which, by the way, will be dissipating at the New Moon in Virgo on the 20th. Accept your responsibiities with grace, and prioritize them; multitasking, whenever possible, will serve you well. If there is any uncertainty on your part during the month of September, it will likely be due to you sitting on the fence, pondering the proper moment to launch a creative endeavor which will propel you away from the hard times, so as to never repeat them. As the month begins, you do not seem able to choose a direction, Aries. Part of you wants to go one way and rise to any challenges you may be experiencing. The other part of you wants to abandon it all in pursuit of a fresh start, but you can not clearly see if this is your goal. Seeking proper advice would be in your best interest before you set out to create any changes. The timing does not appear to be right for making any rash moves; keep your focus toward security and do not engage in any type of risk-taking. Be mindful of what you say to others as you could see a door close on the hard work you have been attemtpting to do. Taurus, your focus has been around the home and your security within it. Around the time of the New Moon, you remain determined to step into your new identity and stand on your own two feet. A social gathering of some sort could prove to hold the basic info you require in order to begin anew. Rejoice in the now and let go of the fears which hold you back from making progress. There is a creative solution coming your way which allows you to separate from a situation and to prepare for your future. Do not fear taking charge in order to create your vision. Be willing to take a chance and be a little adventurous, for you are so ready to go discover a new chapter. You may find yourself using unorthodox methods to get your point across in September, Gemini. The question is whether or not it will be well received, or if things will merely become more off-kilter for you. Any rash decisions, or words spoken without forethought could bring some form of undoing and trip you up, leaving you feeling like you have been hung out to dry. Whatever is lacking for you requires a different perspective on your part; a direct one does not seem to be working. You can bring healing to the situation and creatively fix it in some way. Try bringing some sincere compassion to the table and be more flexible in your demeanor. Things can change and ease up for you, but others must perceive you as utterly reliable and routine for that to happen. There can not be two sides to this story. Cancer, it is time to return to the drawing board this month. You know a new journey is on the horizon, but it is necessary to put nose to the grindstone and work out the details on that list you have been carrying around in your mind. Remember, Equinox to Equinox. By the time the Equinox arrives on September 22, you will finally find yourself making a choice which aids you in manifesting the pursuit of your hopes and dreams. Try to leave emotion on the shelf as you sort through things in a logical fashion. Whatever power represents to you, in the form of that which makes you feel secure, is what you are setting out to achieve in this timeframe. It will be necessary to take into consideration how your actions could affect loved ones, and how you will provide for their protection. That one plaguing issue hanging over your head, Leo, needs to be dealt with this month. The timing will be right by the 22nd, and you will see that, at that time, the scales of Justice will tend to swing in your favor. By next month, you should be able to see your way clear to making choices which will help to alleviate any associated stress, and ultimately allow you to feel as though you can breathe once again. It will be necessary to go over any pertinent documents with a fine-tooth comb, learn the facts of the matter and leave no stone unturned. This will allow you to arrive at a fair and equitable solution. Virgo, before the Sun leaves your sign and moves on into Libra, you will be doing a careful assessment of the status quo. Whatever does not sit right with you at this time will require an important decision of the life-changing variety. Once you have made said decision, you will need to complete the work necessary to carry it out, and may find yourself burning the midnight oil to do so. Rely heavily on your beliefs right now, and remain grounded as this will help to carry you through in a situation from which you need to be free. Even if you have a day where you think you can not go on, you can; your new beginning and abundance are achieved through going forward and not glancing backward as you set out to see what life has in store. It is always a quiet time, Libra, prior to the Sun moving into your sign, which will occur this year on September 22. Intuitively, you already know this, at least by the New Moon you are realizing it, as you see relationships moving forward at the Equinox. 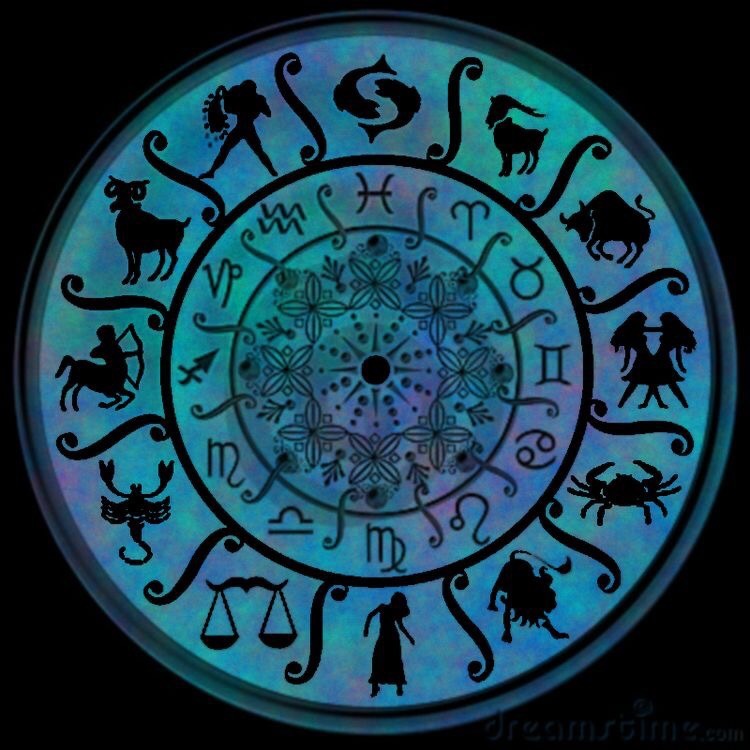 Things which have been going on behind-the-scenes will be letting loose and propelling you forward during the four-week period the Sun is in Libra. In some ways, you appear almost motionless, for after so long you have come to believe that things may never change. Your discontent with a particular matter, while it leaves you feeling restricted, may finally move forward to your liking once Jupiter in Libra leaves shadow on September 9. Keep talking to people, for the potential exists for the right conversation to open an important door for you. Scorpio, a specific conversation, or relationship, may not be yielding what you want from it. Your dissatisfaction could be stemming from the need to sacrifice something you do not wish to in order to see your way to success. This does not sit well with you and may be causing undue worry. Betrayal from another may be the precursor to a broken relationship you are uncertain if you can fix. All signs point to you receiving the new beginnings which you deserve, in spite of the actions of another. Success comes by maintaining an incredible emotional balance which allows you to have uncoditional love for humanity. Spending too much time dwelling on the past, Sagittarius, can cause you to shirk responsibilites. It is time to put yourself back on track at the Full Moon in Pisces, as eclipse season and Mercury retrograde will both be in your rear-view mirror. New growth is possible with a no-nonsense attitude which can take you far and help smooth over any recent rough spots. Stability will find you when Saturn has left your sign, but you are in a position now to find creative means to put an end to the way it has all made you feel. Sage advice finds its way to you through the divine workings of the Universe. Begin fresh at the New Moon and prepare to manifest and open a few new doors. Capricorn, it is likely you will find at least one relationship to be disappointing to you in September. Calling it quits are words which may actually be used to decscribe the scenario, whether it be personal, or work-related. 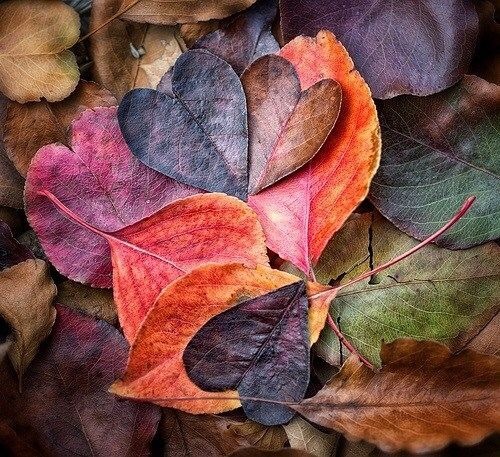 You have been meandering along thinking the best of everyone, unfortunately to find their true colors have been revealed to you, leaving you feeling betrayed in some way. It will be clear to you by the Equinox that you need to separate from this entirely, which somehow brings in the question as to how your future will proceed as a result. Do you have the ability to stand on your own two feet? Change is coming and a new you is emerging from all of the recent energies. Have patience with yourself as you sort through all of this. Your desire to break out and have it all is unwavering, Aquarius. You may make a sudden decision, but should spend some alone time with it before making the announcement and going public. If you are following your intuition, you will realize that your quest for the new you could ruffle a few feathers along the way, and rock the boat, when, perhaps that is not your desire. You will defend your belief of what will make you happy to any challengers who may arise. Conflict avoidance is possible, if everyone is playing by the rules, but avoiding the truth can lead to you fending off extreme criticism. Pisces, it is time to see beyond the smoke and mirrors and utilize all resources you have available to you. There is no time for daydreaming, and you need to stick with the facts to pull off the feat which you hope to accomplish. Overtime may be in order, but you do not seem to mind. The Universe has your back and is working to lessen your stress. Take charge in the face of challenges and do not let any existing competition worry you. You are winning in the long haul, and the Sun is once again rising in your life before the month runs out completely. This entry was posted in Astro-Tarot, General Tarot, Love and Finance, Patreon, Readings, YouTube Videos and tagged Aquarius, Aries, Astro, Cancer, Capricorn, Gemini, Guidance, Leo, Libra, Path, Pisces, Reading, Sagittarius, Scorpio, September, Tarot, Taurus, Virgo. Progress, success, perseverance, teamwork, planning. Harmony shines as Soma, Pneuma, and Psyche combine their concentrated creative energies. Their state of meditation elevates raw creativity. Focused and committed, they cooperative well together and deliver quality workmanship, in turn being rewarded with healthy progress. The shimmering golden coins are the fruits of their work. You are the master of your creativity and skills. With determination and focus, your talents and energy will be utilized to create something new and divine. Dedication toward your goal will flower growth and evolution. When teamwork is beneficial, map out a strategy and draw upon the ingenuity of the others for a successfully completed mission. Impatience toward details. Boredom and preoccupation. Loss of direction. Overlooked talents. 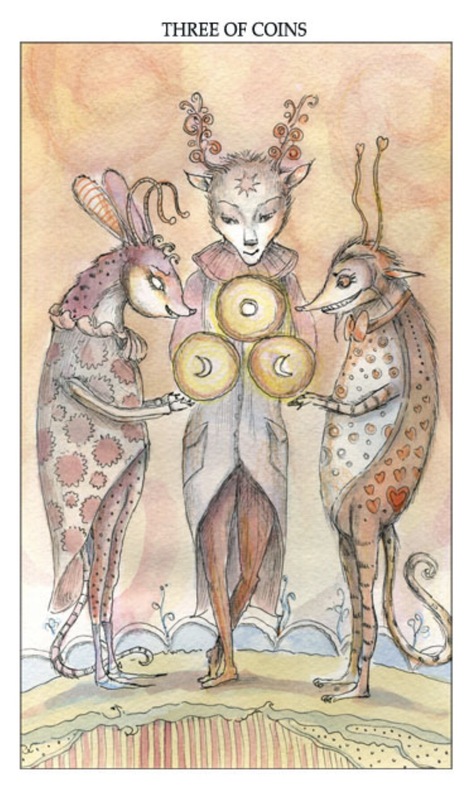 This entry was posted in Artist, Deck Review, Featured Card of the Day, General Tarot, Readings and tagged 3 of Pentacles, Joie de Vivre, Paulina Cassidy, Tarot. It has been a while since we have seen Charlie Brown; he appears to be just slightly tired. Recent weeks and events have been chaotic, even stressful for some, yet, lo and behold, today is August 31! It is okay to say UGH!, for August has been a crazy month of twists and turns, with change springing forth around every bend. 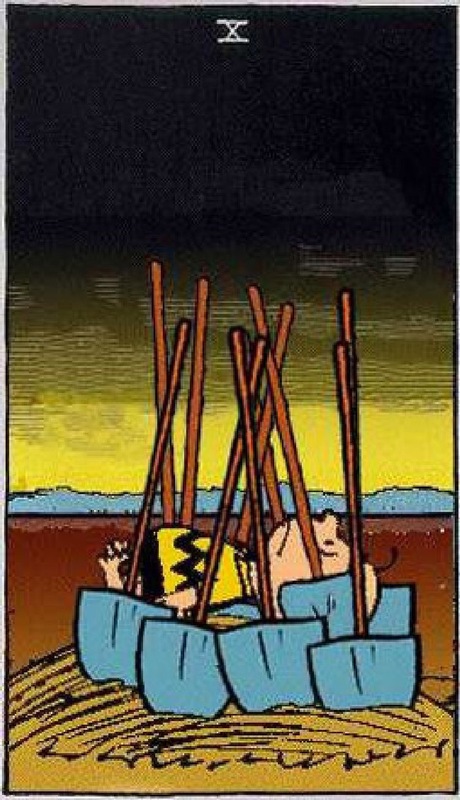 Remember with the 10 of Swords that there is the promise of a new day dawning. Tomorrow will be September, and by the Equinox on the 22nd, things will be shining much brighter in your world. Bid goodbye to August and prepare to step into the new identity which awaits you in the next several weeks. As a side note, there have been betrayals which have come to light during this month. Eclipse season brings about endings which are permanent. So, pick yourself up, dust yourself off, and prepare to move on to the next part of your journey. You were not meant to stay in this spot and dwell on every negative aspect. This entry was posted in Astro-Tarot, General Tarot, Love and Finance, Patreon, Readings, YouTube Videos and tagged Finance, Guidance, Love, Money, Path, Reading, September, Tarot. Celebration, joy, abundance, partnership, indulgence. Gleam, Glitter and Glow dance together in celebration of their blessings and achievements. Their dancing and music regenerates the heart’s magic and replenishes the spirit’s joy.Waters of vitality spring forth from three cupflowers on Glitter’s head. Glow supplies a plethora of fruit, a symbol of abundance. The scarab beetle dancing at their feet carries a message of regeneration and creation. All that you’ve put effort toward begins to flourish. Celebrate your life’s wellspring of nourishment with loved ones and friends. Happiness and well-being bring forth feelings of healthy vitality and replenishment. 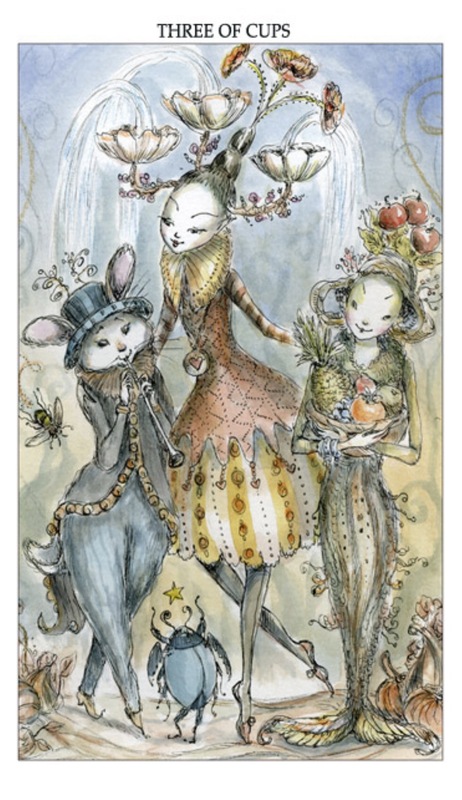 This entry was posted in Artist, Deck Review, Featured Card of the Day, General Tarot, Readings and tagged 3 of Cups, Joie de Vivre, Paulina Cassidy, Tarot. Can it be that something is finally coming together with your plan? Do remember that Mercury is still retrograde, so this may not be the final version, but perhaps the recent direct motion of Saturn is allowing you to make a few strides. The 3 of Pentacles is basically life’s blueprint being put into action. Very often this requires a team; soon it will be time to enact the actual plan. 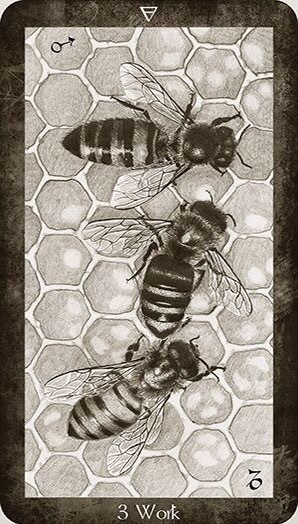 In this card, we see the worker bees working together as a team to get the job done. Use today to see how things are fitting in with that list on which you have been working, and to determine if the proper people are in place in order to help bring about the changes you desire. This entry was posted in Card of the Day, General Tarot, Love and Finance, Patreon, Readings, YouTube Videos and tagged 3 of Pentacles, Card of the Day, Guidance, Path, Reading, Tarot.